anthropologist Jeffrey S. Juris. In 1999 he participated in the protests against the World Trade Organization meeting in Seattle. 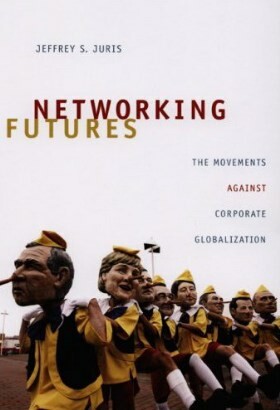 Now he has published an ethnography of the transnational anti-corporate globalization movements called Networking Futures: The Movements Against Corporate Globalization. The book chronicles his experiences organizing and participating in protests from Seattle to Prague to Barcelona. From his base in Barcelona, he followed their connections and movements around the world. He explains how activists are not only responding to growing poverty, inequality, and environmental devastation but also building social laboratories for the production of alternative values, discourses, and practices. Hindus and Muslims eat breakfast together; Christian nuns join Tibetan monks in a chant. At the World Social Forum in India, getting to know the person sitting next to you was at least as important as hearing the speeches by the stars in the movement for a just globalisation. The Indian newspapers were thrilled at the amount of people from all countries of the world who came seeking knowledge. “There’s something intoxicating about ordinary people from all parts of the world gathering at one place,” The Times of India writes, telling enthusiastically about an Australian woman trying to understand the struggle of the Telugu farmers, and about a burly Austrian asking a petite Tibetan girl about her leaflet against the Chinese occupation.